How to Import to Georgia? How to import to Georgia? 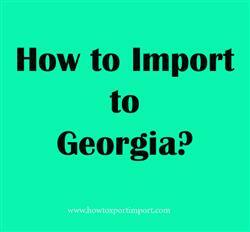 What are the import procedures in Georgia to move goods? Explain about import registration process, cargo movement to Georgia from overseas countries, Import delivery process in Georgia etc. Detail the import methodology in Georgia. This post explains about step by step procedures that need to be finished with Georgia government authority for importation to Georgia. All natural persons or legal entities are approved to conduct export and import process in Georgia. For commercial purpose, a registered trade with concerned license (if required) as per the business and have enlisted in the Trade and Company Register of the country is must for exporting and importing of products from and to Georgia. Georgia Customs department is administered by Georgia Revenue Service under the Ministry of Finance. They are responsible for collecting revenue from customs duties and domestic taxes. It is responsible to protect the society from adverse effects of smuggling and it facilitates the legitimate movement of goods and people across the border. Georgia Revenue Service, a legal entity of public law of the Ministry of Finance of Georgia, executes state control on the whole territory of Georgia. Their main task is to support business in Georgia, create the most favorable environment for establishing of new businesses and their development, formation a just, simple and reliable tax system. The importer or representative has a possibility to connect to relevant server of the Revenues Service and access to “Asycuda” and/or “Oracle” and /or Automated Data System of special cargo customs declaration. The importer should make sure that they made all of the correct import documents that are required to get clear the customs formalities, satisfy all compliance and regulations. Understanding the right documents is essential for smooth import and export procedures. The import documents required in Georgia depends up on the regular trade policy of Georgia Government, the nature of goods importing, specific goods importing to Georgia. This post explains about different phases in import process that every importer needs to go through in Georgia. Import registration procedures required in Batumi. Import Licence process in Kutaisi. Process to import to Tbilisi. Requirements of registration to import to Batumi. Registration requirements in Kutaisi to import. How to import to Batumi? Formalities for import to Kutaisi. Procedures to import to Tbilisi. Need to import to Batumi. Explain to import to Kutaisi. Information to import to Tbilisi. Step by step process to import to Batumi. Methods to import to Kutaisi. How can I clear customs to import in Batumi. What Customs formalities required to import in Kutaisi. What should I do to import goods in Tbilisi. How to get import customs permission in Batumi. What are the documents need to be submitted to import at Kutaisi port customs. Guidelines to import to Tbilisi. Please guide to import to Batumi. Help to import to. Procedures required to import to Kutaisi. Requirements to import to Tbilisi. Clarifications to import to Batumi. How can I import to Kutaisi. What should I do to import to Tbilisi. Which documents should I provide at Tbilisi customs port location for import. Documents need to move cargo out of customs at Batumi port customs location. How to export from Georgia?